Recovery is not only a big part of a successful racing tour, but also of a successful workout week. When does recovery begin? It starts immediately after you cross the finish line. What you do to cool down, rest your mind, and nourish your body is the key to how soon you can train or race again. The first thing I reach for after the race is water and my Vega Performance Protein. This natural plant-based product builds and repairs my muscles and reduces recovery time between my training and races. It is dairy, gluten, and soy free and I love the chocolate. I mix this Vega Sport powder with rice milk, almond milk, or just water to begin the repairing process with its 26 grams of protein per serving. If I do not have the powder, then I reach for water and the Vega Sport Protein Bar with its 15 grams of protein. Below I am having a Protein Bar after our 8 mile Saturday workout, strength exercises, and flexibility. We were soaked in the Florida heat, but it was good preparation for our 2013 Body Protection Tour that begins in the Middle East early next month. 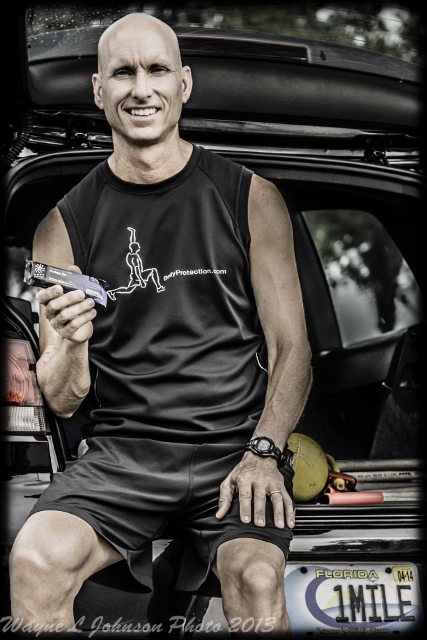 I have been using Vega Sport products since my first running tour in 2008. I take the Vega One nutritional shake first thing in the morning when I awake and then the Vega Sport recovery products after every workout. Treat your body right and start your recovery from the inside first so you will be able to successfully perform again later! Posted in - My Daily Journal, Author - David O'Meara, Topic - Nutrition, Topic - Recovery.